The Committee remains alert to the concentrated and highly competitive nature of the South African retail market, as well as a shortage of retail-specific skills, and sets remuneration levels accordingly. King IV emphasises fair and responsible Executive remuneration in the context of overall employee remuneration and how companies are addressing this gap. In 2017 increases awarded to Massmart’s Executive Directors, the Executive Committee and Divisional management teams averaged 6.2%, in line with the average percentage of increases to salaries across the Group. Commencing in 2014, with the assistance of an external party, Massmart formally and extensively reviewed remuneration within and across the Group, with specific emphasis on an analysis of fairness across race and gender. Although no evidence of intentional discrimination was found, there are outliers and these are being addressed. Most disparities could be justified by qualification, years of experience and tenure differences. The process of managing and addressing existing outliers is ongoing. As disclosed in Section 2, the AIP for 2017 is linked to approved annual PBT targets for both the Massmart Group and its Divisions. The following illustration shows the achievement to plan and actual pay-outs received by the Executive Directors. As noted, the financial performance measure of the AIP has been changed to 100% PBT from 2017 onwards. The Board supports the transparent reporting of Executive remuneration but they believe that disclosing the prospective PBT target, which forms the basis for the AIP achievement and pay-out calculation, is commercially sensitive information and this has therefore not been disclosed. As mentioned in the Chairman’s letter, in 2017 the Remuneration Committee agreed to utilise the discretionary 25% cap as a non-financial AIP to drive the achievement of an improved BBBEE score. Based on timing of these results, the actual payments will only be able to be reported in the 2018 report. The SIP was established in September 2013 and is linked to approved ROI and sales targets (refer to Section 2 for more information). The first vesting of this new plan took place in September 2016. The next vesting of performance share awards will take place in March 2018 (for performance in years 2015/6/7). This vesting of awards issued in 2015, will be as a result of the following performance achievements to target in the subsequent three years: 100.1% for 2015, 104.4% for 2016 and 72.3% for 2017. The next vesting of restricted share grants will take place in September 2018. The illustration below shows previous performances against approved annual nominal sales and ROI targets. Nominal sales: total sales of the Massmart Group for a financial year. Return on investment (%): adjusted operating profit/average invested capital. Adjusted operating profit includes finance income and adds back depreciation, amortisation and rentals. Average invested capital is average total assets of continuing operations plus average accumulated depreciation and amortisation less average accounts payable less average accrued liabilities plus occupancy costs x8. The comments below provide further background and context to the figures disclosed in the tables which follow and the composition of remuneration outcomes in 2017 for the CEO and CFO are represented graphically below. Guy was awarded an 8.9% annual guaranteed package increase in July 2017. In terms of Massmart’s AIP, Guy received an incentive payment of R3.1 million (equivalent to 6.1 months of salary) based solely on the Group’s actual operating income performance against the 2017 plan. During the year ended December 2017, the Bluett-Hayward Trust, of which Guy is a discretionary beneficiary, sold 19,912 shares and recognised a R1.4 million gain. Through the Employee Share Trust, Guy holds 436,994 Massmart shares and options. The average length of time that he has held these is 7.1 years and the average strike price is R127.30 per share. Guy also owns 69,306 Massmart shares directly. Through the SIP, Guy was awarded 39,431 performance share awards on 18 April 2017 and 16,038 restricted share grants on 15 September 2017. Whilst Guy does not have a fixed-term contract, he is contractually bound by a notice period of twelve months. Hans was awarded a 6.9% annual salary increase on his US-dollar denominated basic salary in July 2017. 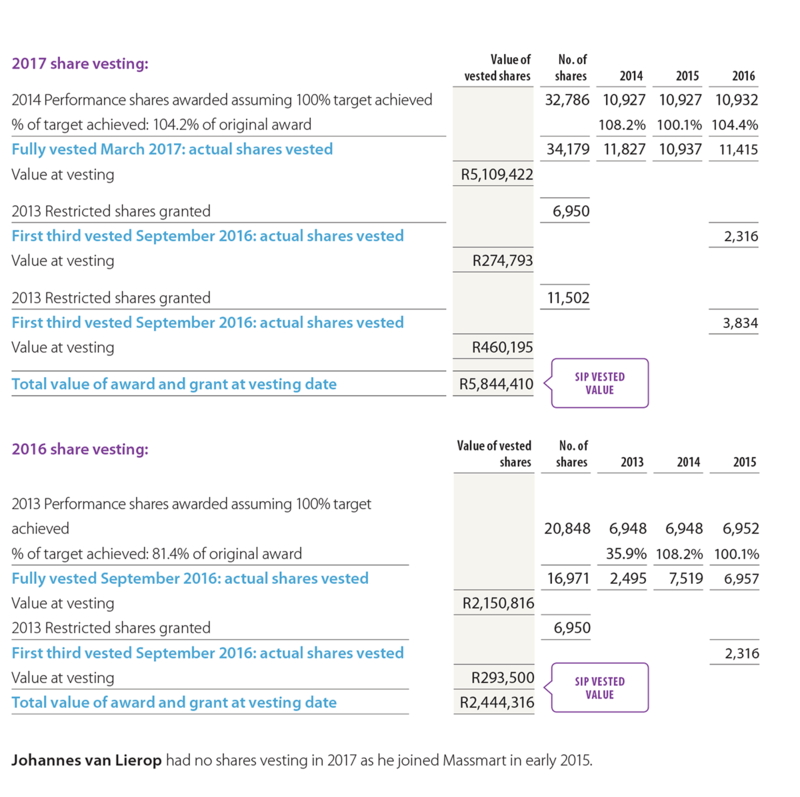 In terms of Massmart’s AIP, Hans received an incentive payment of R2.4 million (equivalent to 6.1 months of salary) based solely on the Group’s actual operating income performance against the 2017 plan. During the year to December 2017 Hans did not sell any Massmart shares. Through the SIP, Hans was awarded 30,760 performance share awards on 18 April 2017 and 12,086 restricted share grants on 15 September 2017. Whilst Hans does not have a fixed-term contract, he is contractually bound by a notice period of twelve months.